Rising out of the vast Lake Superior is an island that is isolated like no other national park. Instead of visiting for a few hours like some parks, visitors typically stay for three to four days at Isle Royale. And the 45-mile-long island fills up those days with much to do. Isle Royale truly feels like an escape. In fact, visitors must carry in what they need and carry out everything, including garbage. The land feels rugged – waterfalls can be foggy, mosquitoes and gnats can sometimes be frustrating, and since campsites cannot be reserved, a backpacker may never feel certain where the day will end. Once exploration begins, it is common to spot animal tracks, moose grazing, and beavers working in ponds. Foxes have even been known to snoop around campsites looking for food. There are trails to hike, guided boat tours to learn from, and waters to swim. The island is full of life and is truly a land to investigate. Native Americans mined copper at Isle Royale long before Europeans discovered the island. In fact, archeologists have excavated shallow mining pits dating back over 4,500 years. In 1783, the island became a U.S. possession. Modern copper mining began in the late 1800s, which resulted in large areas of the island being burned and logged. This led to settlement development. Soon, Isle Royale became popular for summer homes and as a wilderness retreat. It was finally designated a national park on April 3, 1940. In 1980, the island was also designated an International Biosphere Reserve. Isle Royale's historic lighthouses have stood for more than a century, helping vessels to safely navigate the unpredictable waters of Lake Superior. The Rock Lighthouse, built of stone and brick, was first lit in 1855. The Isle Royale Lighthouse, located at the entrance to Siskiwit Bay, was completed in 1875 at a total cost of $20,000. The Passage Island Lighthouse, built in 1882, is the northernmost American lighthouse on the Great Lakes and serves to guide ships into Thunder Bay. The 117-foot Rock of Ages Light Station was completed in 1908. The park is closed from November to mid-April. Visits are most popular from June to September. Keep in mind that mosquitoes, black flies, and gnats are pesky in the months of June and July. The most convenient airports are located in Houghton, MI and Duluth, MN. (Find Flights) To get to the park you must either take a seaplane or board a passenger boat, whether it be commercial or through Park Service. Isle Royale is located 56 miles from the Michigan mainland, 18 miles from Minnesota’s shore, and 22 miles from Grand Portage. Keep in mind that the port you select will determine the length of your visit. Reservations are required and are recommended at least one to two months in advance. Contact the park (906-482-0984) for the boat schedule from Houghton to Rock Harbor. The Park Service’s boat will transport boats 20 feet and under between those points. Royale Line offers boats from Copper Harbor to Rock Harbor and may be reached at 906-289-4437. Contact GPIR Transport Lines at 715-392-2100 for boats from Grand Portage to Windigo and Rock Harbor. For seaplanes, contact the Seaplane Royale Air Service Inc. at 877-359-5753 or 218-721-0405. Users are charged $4 per day to visit Isle Royale. That fee does not include accommodations, boats, or seaplanes. The park sells an individual season pass for $50 allowing for unlimited visits from April 16 to October 31. Also available is a season boat rider pass for $150 for the same timeframe. It covers all persons on board. All other national park passes may be used at Isle Royale. On an interesting sidenote, you can have your wedding at Isle Royale. A special permit is required, and you can learn more about it on the park's official website. Windigo: It is easy to spend a full day in this area. Start with a nature walk which serves as a great introduction to the area. This one-hour tour explores the area’s natural and cultural importance. If you miss the guided tour, hit the Windigo Nature Trail. This 1.25-mile loop showcases how retreating glacial ice created the island. Next, check out the Feldman Lake Trail which will give you a great view of Beaver Island and the harbor’s forested shore. Also, a fun stop is the fenced-in Moose Exclosure. The area shines a light on just how differently a firest can grow when moose aren’t there to graze on it. Rock Harbor: This one is difficult to squeeze into just one day. Start with Stoll Trail, a four-mile loop that starts at Rock Harbor Lodge and highlights mining areas. The trail will continue to Scoville Point which is a great spot to view some of the 200 islets that form the Isle Royale archipelago. Continue further, and check out the Smithwick Mine, one of the many remains of 19th-century mining. Take a shuttle boat to Raspberry Island where you can picnic and explore a forest full of white spruce, balsam fir, and aspen trees. Another boat can take you on a guided historical tour. The first stop is Edisen Fishery which once belonged to Pete Edisen – one of the last commercial fishermen on the island. Next, is the Rock Harbor Lighthouse which was built in 1855 and contains a maritime exhibit. 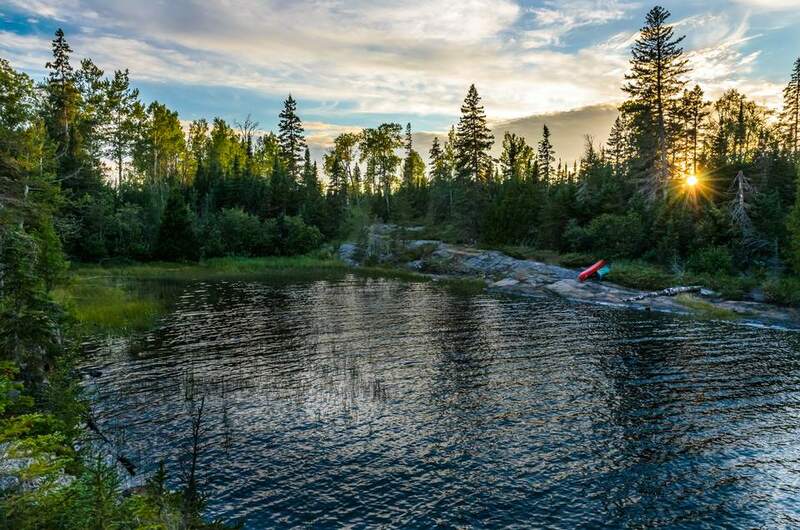 Backcountry: This remains one of the most exciting ways to visit Isle Royale National Park. It is important to plan around the passenger boat arrival and departure times. Once you plan your visit, get ready to explore the wilderness. One suggestion is Rock Harbor Trail which hikes through forest, bog, and rocks. After about two miles you will see Suzy's Cave, an unusual water-carved arch. Three Mile Campground is a good place to set up camp. Also be sure to check out Daisy Farm where, yes, daisies flourish. The backcountry is your best bet to spot wildflowers and wild animals. Keep a lookout for moose, beavers, and gray wolves. There are 36 backcountry camping areas ranging from a one to five-day limit. Camping is allowed mid-April through October on a first-come, first serve basis. There are no fees but keep in mind that permits are required. If you are looking to stay in the park, check out the Rock Harbor Lodge which offers 60 lodge rooms. Also offered are 20 cabins with kitchenettes. Outside the park, there is a wide selection of hotels, motels, and inns nearby. The Bella Vista Motel in Copper Harbor is very affordable. Also nearby is the Keweenaw Mountain Lodge. In Houghton, try the Best-Western-Franklin Square Inn with 104 units and a pool. Grand Portage National Monument: During the 18th and 19th centuries, voyageurs traveling the North West Company used to converge at this central supply depot. 22 miles from Isle Royale, this national monument is open from late May to early October. Available activities include hiking, cross-country skiing, and snowshoeing. Pictured Rocks National Lakeshore: Designated the first national lakeshore in 1966, this site highlights intricate sandstone cliffs. Located in Munising, MI (about 135 miles from Isle Royale) this lakeshore is full of sandy beaches, forests, streams, and waterfalls. Available activities include hiking, boating, water sports, and camping.